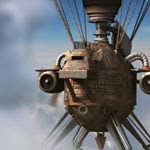 Late end of 2012, I was approached by film maker, director and editor/compositor Arvid Eriksson (whom I'd met through a colleague when creating a conceptual 3D space capsule image for an indie film pitch) to produce a 3D steam-punk styled airship for a Swedish childrens show. The plan - to create a 3D model that he could then import into Adobe Aftereffects and animate in post. 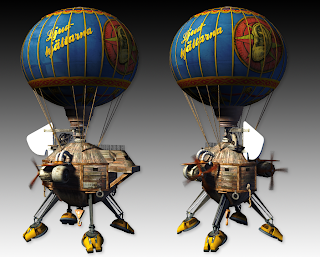 Based on the concept art, I produced a very low quality proxy model using LightWave3D's modeler. Exported out as an obj, this meant the model could be imported into AE by Arvid to animate and get his project blocked out quickly. Rough out proportions, and something for the director to get started quickly. Obviously one was that it really couldn't be too poly heavy or texture heavy since it had to be importable into a compositing package. 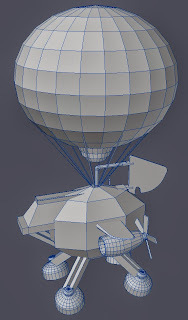 While most CG applications will quite happily render high poly detailed models, After Effects isn't exactly a full featured 3D rendering package - and that also meant a lot of internal custom shaders and texture mapping techniques I could use with my rendering tools would need to be instead based heavily on colour image maps and the general capabilities After Effects offered. 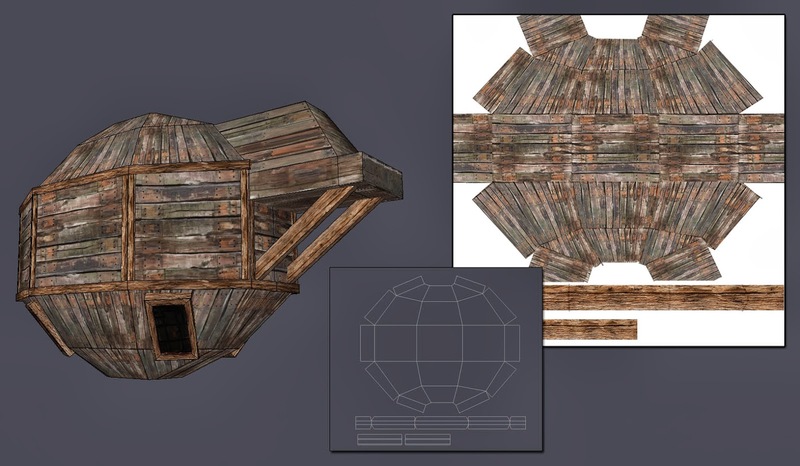 Most the detailing came from image maps, with small detailing modeled where needed. 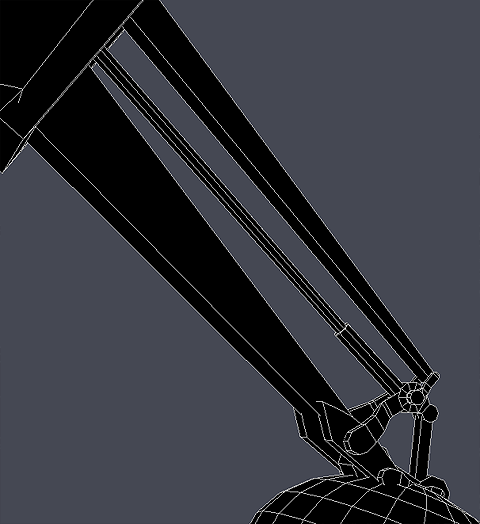 Details such as legs were low-poly - however the 'mechanics' had to still hold up. 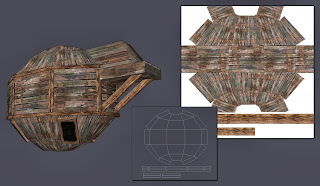 Luckily for me, the only real textures that were noticable at full HD was the overall wood on the main ships hull. To get this to look clean and sharp in a close-up, I simply created the texture map at 4096 rather then the original 2048 resolutions I'd originally been using. Replacing the 2048 res with a 4096 higher quality image fixed close-up issues. After Effects is not a 3D animation tool - we knew that - and as Arvid's project went on, the limitations of what it could do started to become quite apparent. In particular, objects that would move a fair distance would render with artifacts (caused, I can only assume, by depth calculations messing up the back face culling). 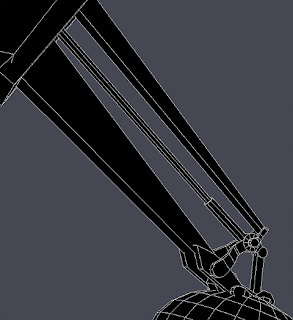 It also doesn't offer any real animation capabilities to add secondary motion - and this meant the model did have a rather "stiff" appearance. Worse still - Adobe's decision to remove 3D model support suddenly meant that this project would need older versions of the software to be edited (and make any future changes quite difficult). With the newer releases of the software having no backward compatible replacement - Well... You can guess the answer on that one. It was decided that we render it in a 3D application (in this case, LightWave3D) and instead plug the image sequences back into After Effects. This meant I could throw in more polys, and while I did add some more "detail", I still let the texture maps control a majority of the look and detailing. I had a real blast working on this project. 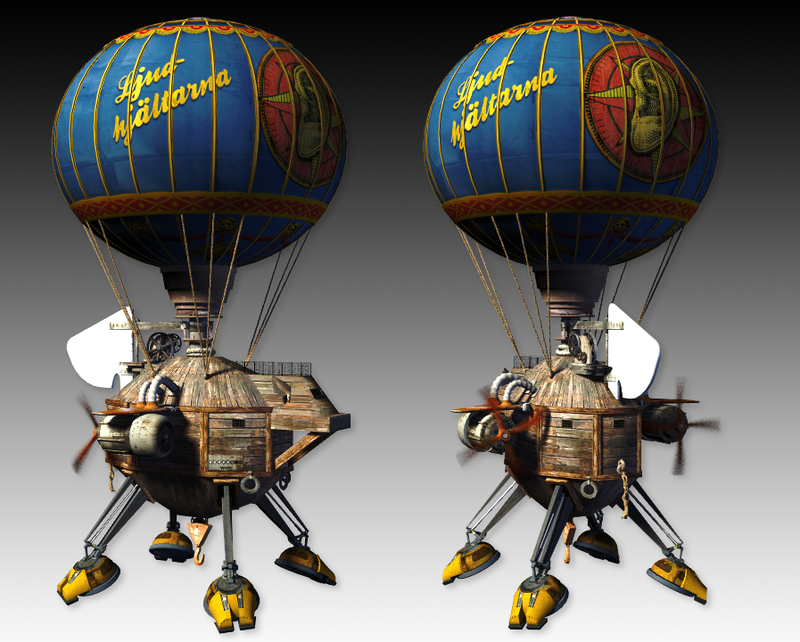 In total, around 25-26 hours were spent with modeling, texturing and rendering on my end. 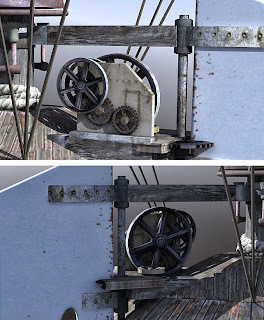 Arvid's work can be seen below. Credits also go to David Giese, who also produced this project along with Arvid for Cinelandia and Scandinavian TV. Make sure to check out both of these guys' websites to see some of the amazing commercial work that they do. Ljudhjältarna, Title Sequence from Arvid Eriksson on Vimeo.